Installing an electrical panel in your home provides the electricity that is routed to all of the outlets, fixtures and rooms in the house. Electrical panels include fuses or breakers, which might require periodic replacement or service. Residential building codes specify the allowable locations for electrical panels so that homeowners can install and use them safely. Electrical panels mount in interior walls or hang on basement walls. However, they might require horizontal clearance, preventing them from being mounted in corners or other tight spaces. 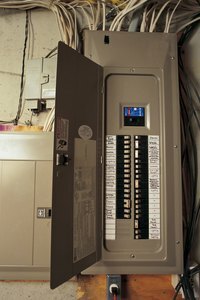 Installation provides a practical limit on where you can install an electrical panel. For an interior wall, the closest the panel can be to a perpendicular wall is the space between that wall and the nearest stud, where the panel will be mounted for support. In a basement, the panel can be attached closer to a corner wall, but only if you have enough clearance for the electrical line from outside and ample room for wiring that leads throughout the house according to an electrician's proposed wiring schematic. Residential building codes or internal guidelines for a builder might also specify the amount of clearance that must be left around an electrical panel for purposes of maintenance, inspection and service. For example, California's state building code requires a minimum clearance of 30 inches horizontally in front of an electrical panel. This means you cannot place an electrical panel close to a corner if another wall, fixture or piece of furniture is within 30 inches of it. The space between electrical panels and adjacent walls is also regulated by the layout of your home and the need for safety. Sparks and high temperatures are possible if an electrical panel fails or experiences a surge. This means that you can't place it close to combustible materials in your home. Some residential building codes prohibit installing panels in closets where clothing is stored, regardless of the distance between the panel and a wall. Although homeowners are typically allowed to install their own electrical panels, the process can be dangerous if you lack sufficient knowledge and experience. During a home building or remodeling project, consult with a licensed electrician to determine the best location for electrical panels, wiring and household fixtures. Use an electrician who is familiar with the building codes that cover your jurisdiction because codes vary by location and violating them could result in a fine.